I have been really lucky with the weather we have been getting this year. The sun has been out and the shorebirds are arriving fast! Yesterday was my first day surveying, I saw a few shorebirds- 13 Least sandpipers, 2 greater yellowlegs, and 1 black-bellied plover (one of my favorite shorebirds that I was eagerly hoping to see). 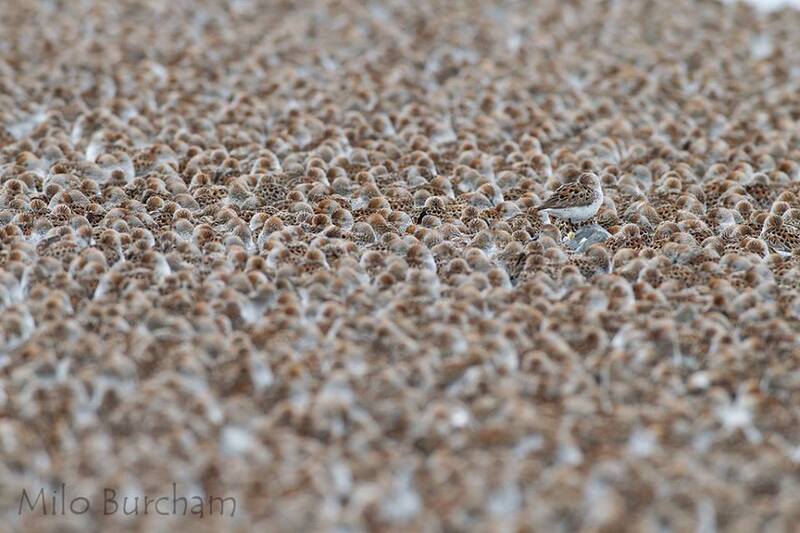 Today was Day 2 of surveys, and WOW did I see A LOT of shorebirds! 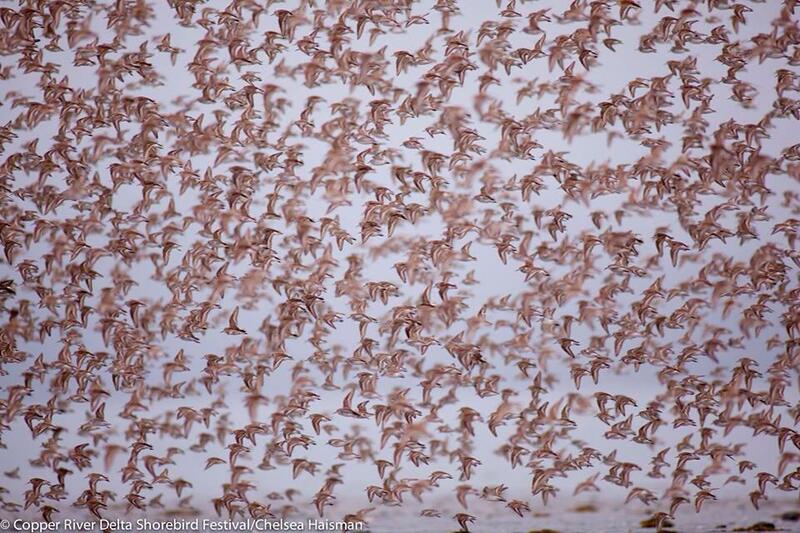 The picture above is from a mixed flock of Western sandpipers, dunlin, and least sandpipers. It was AMAZING to see them fly together, but also a bit frustrating when it comes to trying to estimate the flock size during the survey! 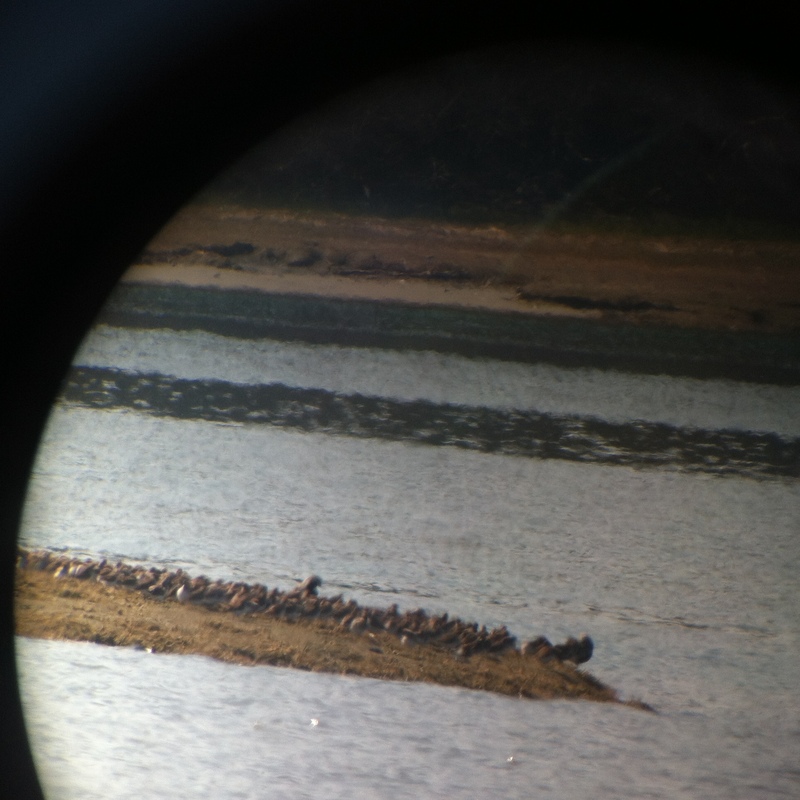 They finally landed on a small island where 5 black-bellied plovers where hanging out. It was pretty awesome to see how different the species where from one another in terms of plumage and size. The black-bellied plover was the largest (11 1/4″) in the flock, dunlin were the second largest (7 1/2″) compared to the little peeps- western sandpipers were just a little bigger than the least sandpiper (5 1/2″) by half an inch. I found least sandpipers enjoy hiding in the vegetation at Hartney Bay. They camouflage so well! I have never lived in a place that allowed me to experience seasons like I am in Alaska. My environment is constantly changing. I witnessed winter, and now it really feels like spring is here! The grass and flowers are beginning to emerge; everything is slowly becoming green as the white snow melts in Cordova. 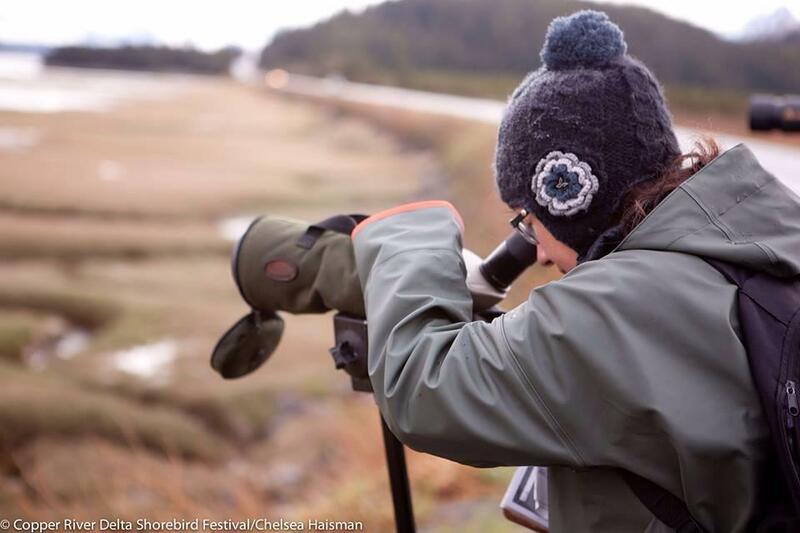 The change in season makes it official; THE SHOREBIRDS WILL BE ARRIVING SOON! I’m looking forward to the shorebird festival and all the amazing activities and surveys that coincide with the arrival of my shorebird friends. 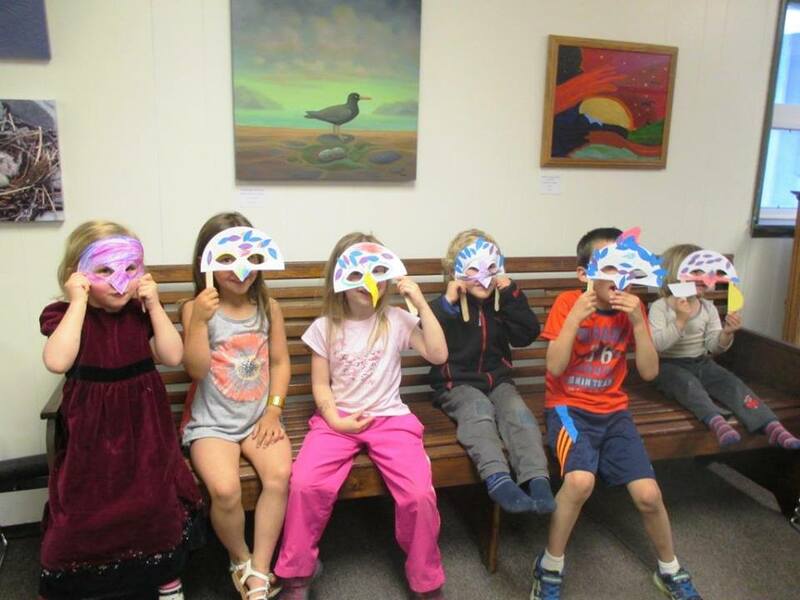 This week I networked with an artist from Argentina who was kind enough to create an illustration for the Copper River Delta Shorebird Festival. Aleteos is her trademark, she is also involved in Argentina’s shorebird festival and their international illustration contest. Here in Cordova, I am working on finding a place to display 25 of the illustrations that were displayed in Argentina’s festival. Collaborating with Rocio and Festival de Bahía San Antonio in Argentina makes this year’s illustration contest theme really relevant – this year’s theme was: “Inspiring Flights. Connecting Skies.” It’s amazing the way shorebirds inspire us by their resilience, traveling far distances throughout the various flyways, and the way they connects people around the world. 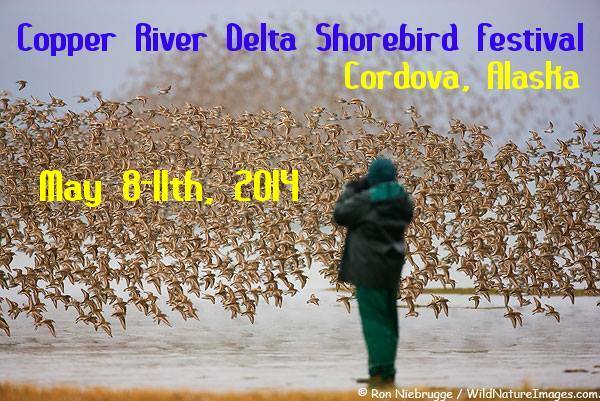 Soon after the shorebird festival, the field seasons will begin here in the Cordova Ranger District. In the wildlife department of the Forest Service we are continuing to prepare for the field season. We are taking inventory of our gear- knowing what we have and what needs to be repaired or replaced is essential for our safety and success out in the field. We have a lot of big projects lined up, and I am excited to write about them as the dates get closer. Till then, stay tuned for lots of pictures and my wildlife adventures! 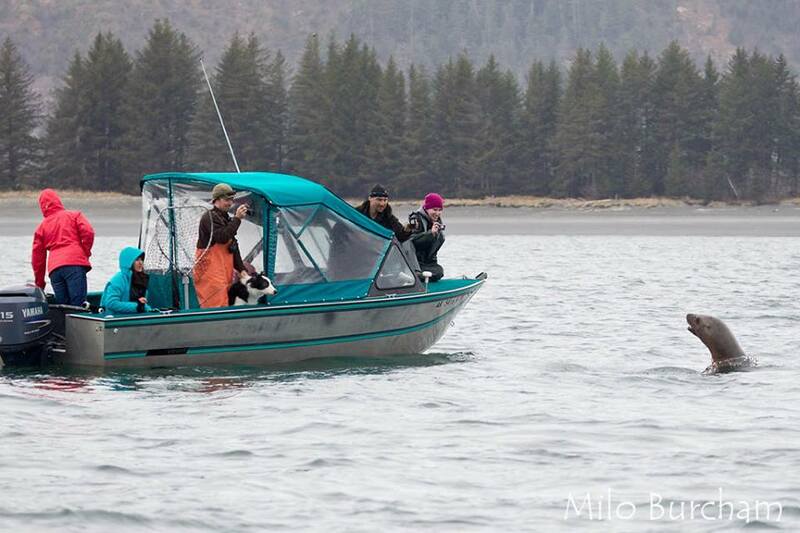 Out on the boat with some of my co-workers (I’m in the bright teal jacket). We saw humpback whales, herring, bald eagles, steller’s sea lions, porpoises, black oystercatchers, harlequin ducks and MORE!